Readers 2 Leaders recognizes parents as a child’s first and most influential educator. We see the importance of providing parents with additional resources to help them support their children; academically, socially, and emotionally. We partner with local organizations that are experts in parent education and host their programs at Readers 2 Leaders. The PASE program offers a series of free workshops for parents in English and Spanish. The program is designed to provide parents with the skills necessary to direct their children’s academic success and guide them to a brighter future. Free childcare is offered during the workshops. 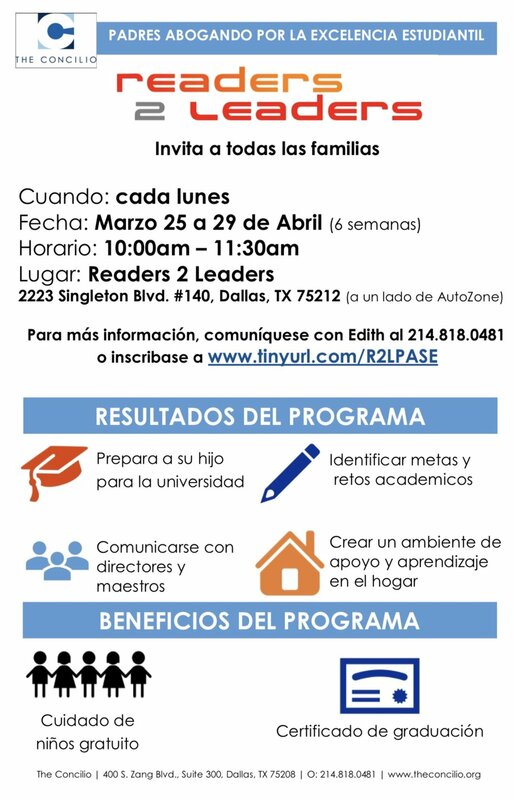 Readers 2 Leaders is excited to host The Concilio in Spring 2019 for their 6-week parent program, PASE (Parents Advocating for Student Excellence).